Prepayment discounts: Pay in full at least 1 day ahead and save $20, or pay a $50 deposit at least 1 day ahead and save $10! 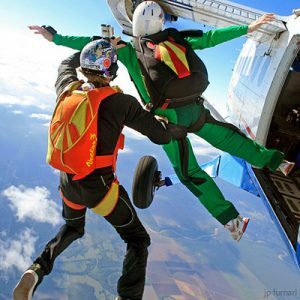 $99 Second Jump Special: Buy your second Tandem adventure the same day as your first and SAVE $80.00 (Normally $179.00). No expiration! Cannot be used as part of a discounted group reservation. 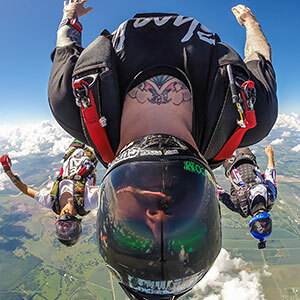 $169 anytime tandem skydive for active/retired military and first responders (police, fire, EMS). No reservation needed; just come in any day and please bring your service ID for verification. THANK YOU so much for your service! Airline Employees: $179 anytime. No reservation needed; just come in any day and please bring your airline ID for verification. Group Rates: More people, more fun, more savings! Are you interested in gathering a group of at least 5 people and getting a group discount? See our group rates (per person) below! If you get a group of 20 or more people, you could jump for FREE! $50 deposit per person or payment in full is required at least 24 hours ahead. Jumpers with $99 prepaid second-jump specials do not count towards group totals. You can also call us at 800-533-6151 or contact our group booking specialist to get started! BEST DEAL: A license in a week package for $2400 (save almost $400). Can’t be combined with other offers. 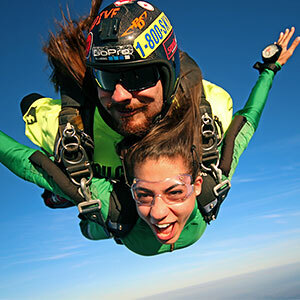 Unlimited Jump Package: Jump all year at any Spaceland location for $8,800! Your jumps get cheaper the more you use it! Shop for lift tickets now!